This is an excerpt from the book Mind on Maps : Navigate your thoughts methodically with mind maps. From the feedback so far, I’ve seen the idea of mind map network to turn quite a few light bulbs on. This is the story of how I first got started with linking maps together. Using one-off mind maps every now and then is one thing. To me, the true power of mind maps as a personal information and management system comes from connecting everything together. I stumbled across this by chance in my early mind mapping days. I was interested in memory techniques and one of those was the mind palace, also known as the method of loci. It’s a technique in which you imagine a physical place, a building with rooms connected to each other. You store memories in each room and recall them later by walking from room to room in your mind. Inspired by the method, I started naming my mind maps as places and link them together. I could then move from one map to another by following the links — as I would walk from one room to another inside the mind palace. I put professional stuff in the office room and personal things in the bedroom. I put things about my past in one room and plans in another. In addition, the house had a hallway that connected all the rooms together — like an index. Separating different things in different rooms felt like a natural way to organize information. By entering a room I could concentrate on the topic of the room and forget about the others for that moment — for efficient use of the precious and limited resources of the brain. After building myself a modest mind house — one map for each room — I noticed that I could quite easily remember my mind maps through this structure. For me, the memories are not as strong and vivid as with a real mind palace, but the mind map version takes much less time and energy to create and change. My purpose with the maps is also a bit different: instead of remembering things directly it’s enough for me to remember where to look for the needed information. It’s more like a blueprint of a memory palace, instead of the palace itself. The palace is just one way to organize information, but I encourage you to try it out if you haven’t yet found a map structure that works for you. At the time of writing this I have close to 1000 mind maps in my collection — all linked together to form a single connected network of thoughts and ideas. I only use a small subset of the maps actively, but if I need to I can reach any mind map from any other mind map by following the links between them. Well, not always. Sometimes the links get broken over time, or I have a one-off map which I forget to link anywhere. A map with no links pointing to it is easily lost. The image in this post is a visualization of my own mind map network. Every dot is a mind map and a line a connection between them. The larger bubbles connect together a bigger number of maps. 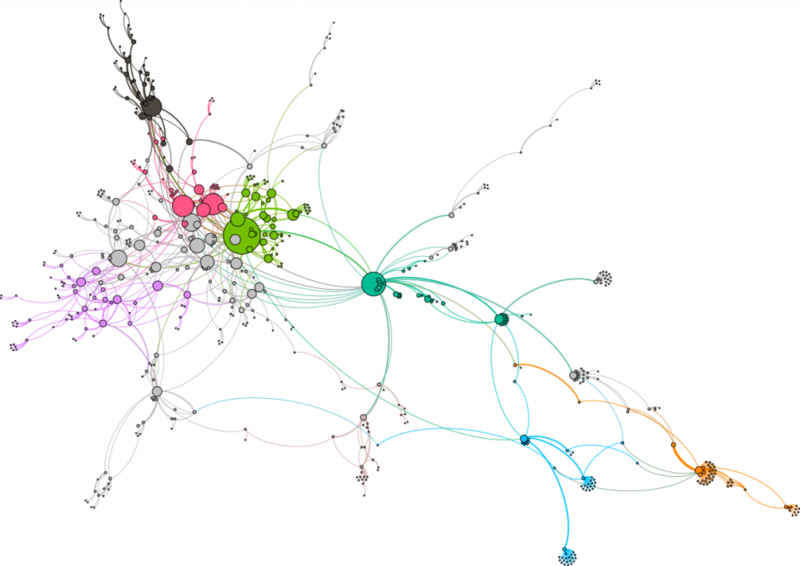 These are typically index maps or other hubs that play a central role in the network. The distance of a map as number of links from the biggest green bubble (my main index map) is a good predictor of how likely I’m to access that map today. There are some maps with no links pointing to them at all — they’re also not in the picture. In practice, those unfortunate maps are almost as good as lost. The general rule, however, is that whenever I create a new map, I link it to the existing mind map network. I suggest you try the same: first create an index map — call it an atlas, a master map or anything you like — and when you work through the following examples, link them all to this index. Practice using those links as the primary way of navigating from one map to another. My guess is, that as soon as you get a feel of it, you don’t want to go back.